The current size of Japan's government debt. 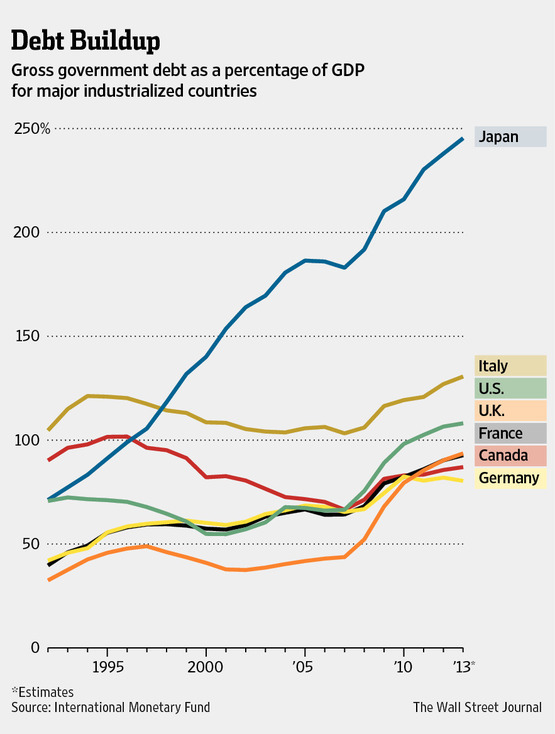 That's $10.5 trillion in U.S. dollar terms or almost 250% the size of Japan's GDP. 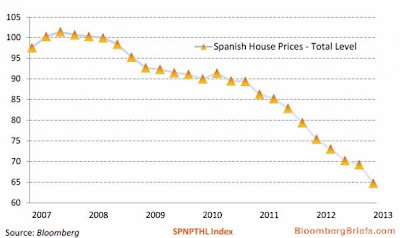 It is the largest ponzi scheme still running in the world today (with the U.S. government bond market just behind). Let's take a quick visual walk around the world. 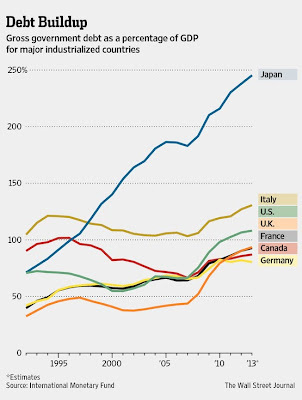 We'll begin with Japan, the largest ticking debt time bomb in the world, where the consumer price index has turned positive in the most recent month. 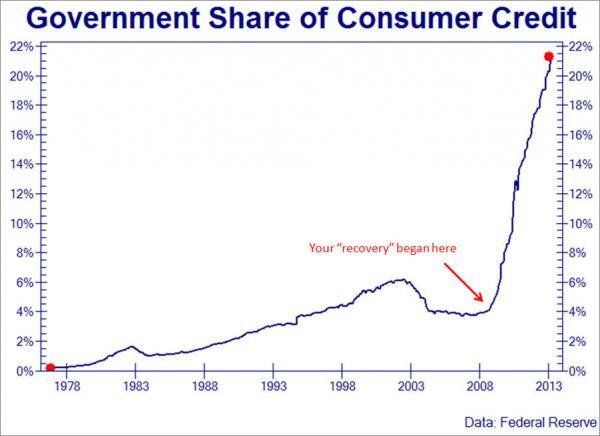 The stated goal of their central bank is to get this number up to 2%. Unfortunately for the Japanese, getting to this 2% number (as Kyle Bass has clearly illustrated numerous times in the past) will be the trigger that ignites their debt bomb. 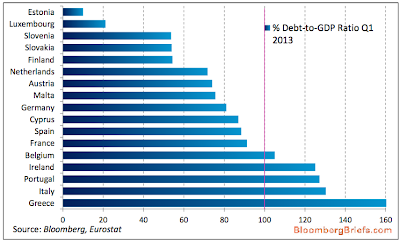 The following shows where Japan's government debt currently stands against many of the other developed economies around the world (which are also in terrible shape). 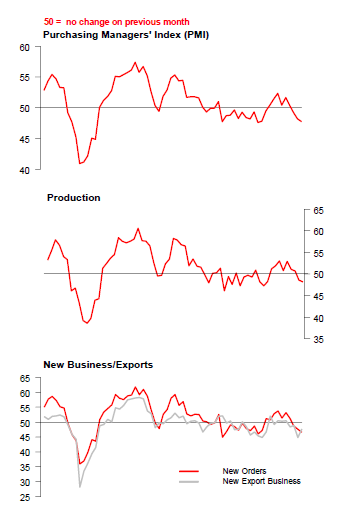 Moving to Japan's neighbor to the east, China's PMI moved back into contraction (below 50) this month. 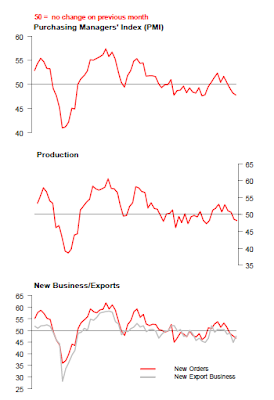 Production and new business/exports also turned negative. As China slows, so slows the world, which does not bode well for some of their largest trading partners (Australia & Brazil). 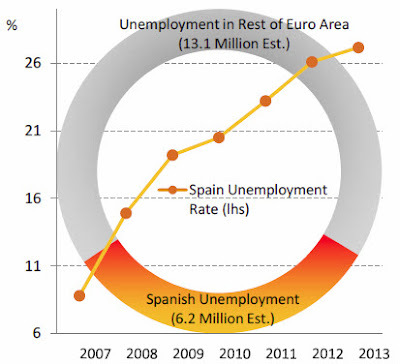 A trip further east brings us to Spain, where we find their economy in relentless deterioration. 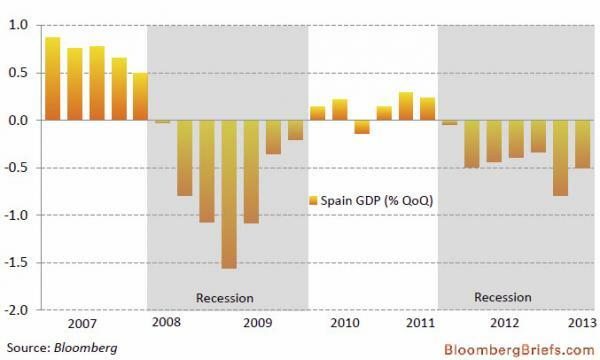 Spain's issues will become front and center again as soon as Germany has completed their elections in September. The following shows that Spain's economy has been contracting since 2011. 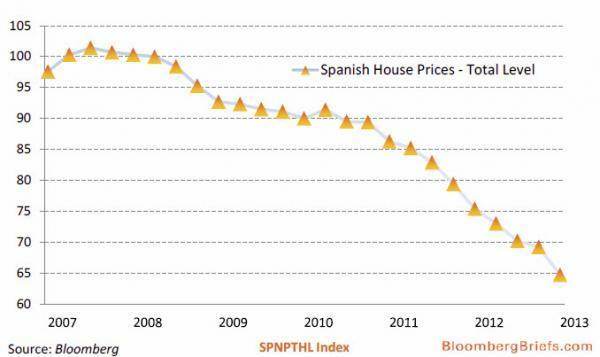 Spanish home prices are in free fall. Spain's unemployed now represent over one third of all the unemployed workers in Europe. Incredible. While we hear that Europe has continued to implement "austerity," the actual numbers show the debt continuing to climb higher month after month. With many economies in contraction, the debt to GDP ratios continue to balloon higher and five nations have now crossed the psychologically important 100% debt to GDP ratio. 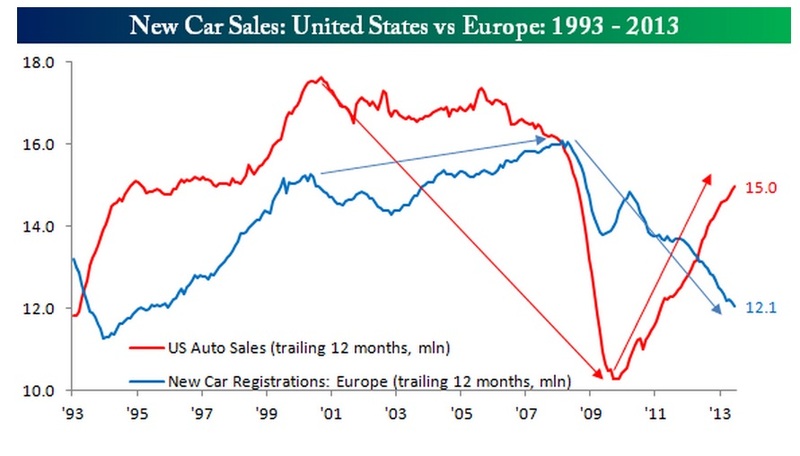 In stark comparison to Europe, the U.S. has offered consumers government backed subprime auto-loans. 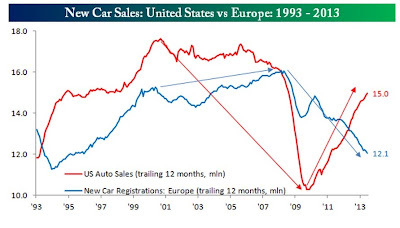 Combined with the Fed's artificially low rates, the result has been a resurgence of new car sales in America (mostly unneeded). The following graph tells the two very different stories. Just east of Europe is the UK, where after printing a negative GDP number in Q4 2012, their economy has been steadily growing. This nominal growth has received a boost from their central bank's steady Quantitative Easing program. The following graph shows their expected growth vs. Europe during 2013. Moving further east we arrive back at the U.S.A. Looking big picture, we can see how far from reality the credit markets or debt (blue line) in the United States has moved from the size of the underlying economy or GDP (red line). This graph paints a story that will not end well. 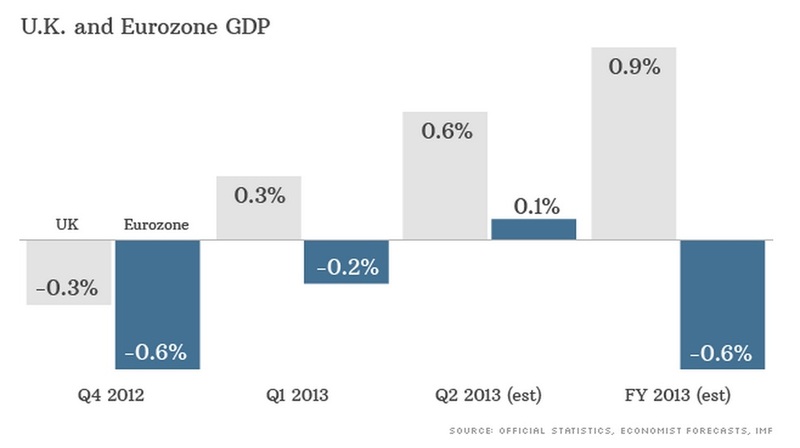 The next excellent graph sums up the United States "recovery" perfectly over the last four years. While the real economy has puttered along at stall speed, the Fed has pumped trillions of dollars into the banking system, which has then made its way into the stock and bond markets (paper assets). While the 99% don't receive any benefit from this, it has healed the balance sheets of the 1%. Another look at the unsustainable divergence between corporate profits and the 99%. Can the stock market go up forever without the real economy improving? 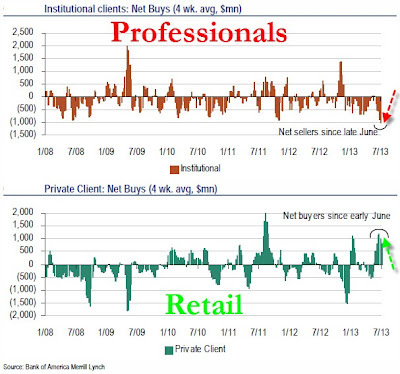 This is what the retail investors are now betting on. What are the professionals doing? Dumping everything. Institutions have never dumped as much stock onto retail investors as they have in the past 4 weeks. 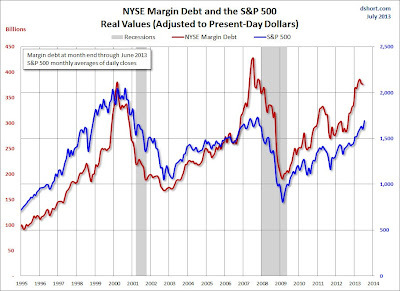 The following chart shows this divergence. The combination of leverage, retail buying, and corporate stock buybacks have been the major catalysts for stocks over the past 30 days. Corporations buying back shares have marked previous tops in the market as their buying soared in early 2000 and 2007. 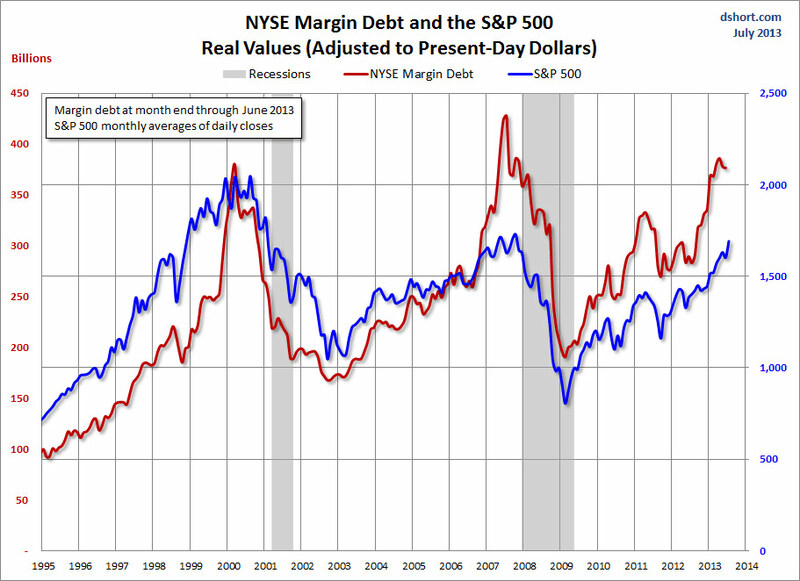 The following provides an update on the NYSE margin debt (leverage) adjusted for inflation. 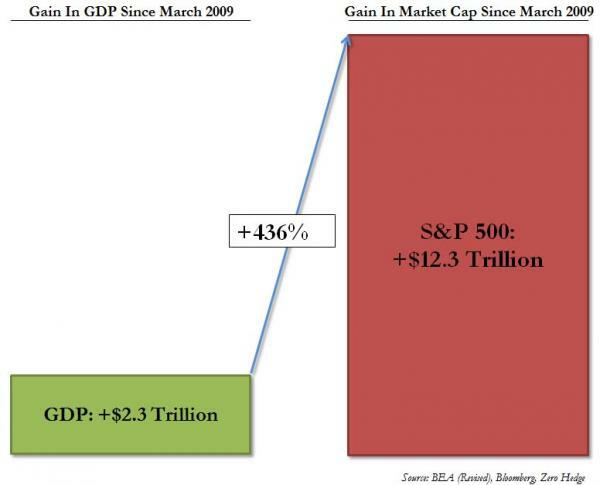 The last time we saw this much separation from the market was late 2007. Jim Chanos commented this week that there are now more companies at 3 times book value than in March 2000. 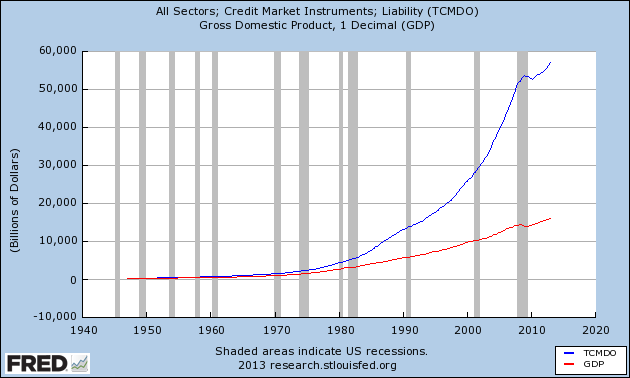 Inflation by definition is an increase in the total money supply and credit. The United States has experienced massive inflation since early 2009. 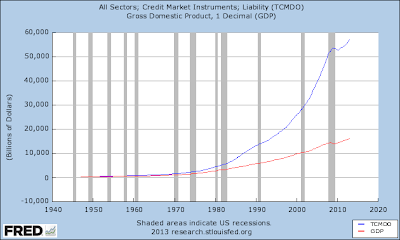 When new money and credit are created, the Fed has little control over where it will be directed. 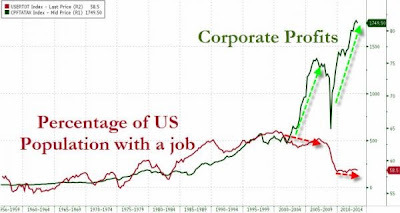 Since early 2009 it has been almost exclusively funneled into the stock and bond markets (with additional trillions now sitting dormant on bank balance sheets), keeping a lid on consumer prices. 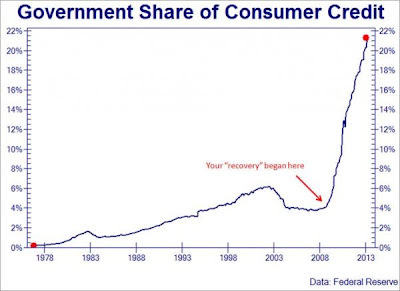 The government has the ability to try and force feed credit out into the real economy which it has done in the student debt markets, mortgage markets, and health care. This has caused a super spike in prices. Government has dominated all credit growth since the current depression began in December 2007 rising from 4% to 22% of all outstanding debt. The student loan debt markets are entering troubled waters as more students are leaving school with larger bills and no income available to pay for them. 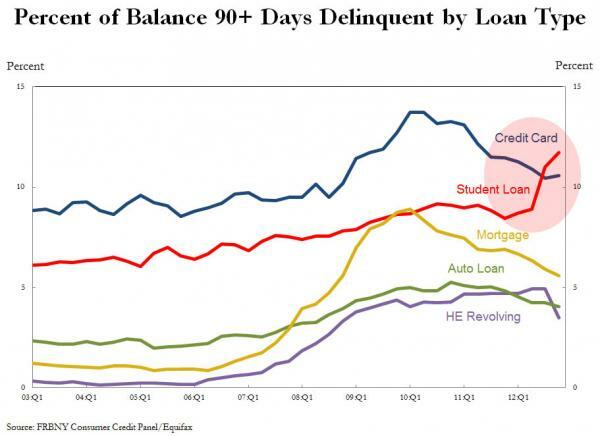 Student loans have now overtaken credit cards as the highest delinquency form of debt in the country. This is astounding. 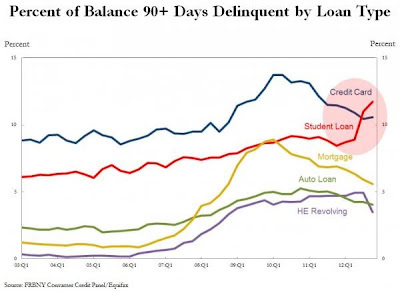 In addition to the noose of debt payments hanging around their necks, these loans cripple their ability to take on debt in the future because their credit scores are declining as their unpaid bills pile higher. Those that avoided college and entered straight into the work force are enjoying the benefits of much higher credit scores (and no student loan bills).